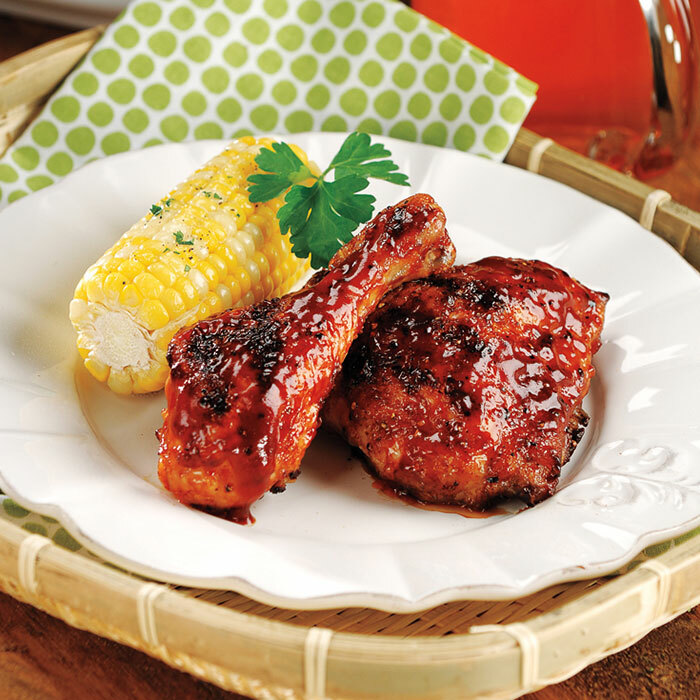 No backyard get-together would be complete without this flavorful barbecued chicken! Prepare outdoor grill for direct grilling over high heat. In small bowl, mix, paprika, Cajun seasoning, sugar, salt, pepper and garlic powder. Trim excess fat from chicken. Rub all sides of chicken with seasoning mixture. Place chicken, skin side down, on hot grill rack. Cover and cook 4 to 5 minutes or until outside of chicken is seared, watching carefully for flare-ups. If flare-ups occur, open grill and move chicken to outside, or cooler, part of grill. Reduce heat to medium. Turn chicken skin side up. Cover and cook 30 to 35 minutes longer, turning occasionally and watching carefully for flare-ups. Brush skin side of chicken liberally with some of the barbecue sauce during last 10 minutes of cooking. Turn off grill, cover and let stand 5 to 10 minutes. Chicken should reach an internal temperature of 165° and juices should run clear when chicken is pierced with a knife. Serve with any remaining barbecue sauce for dipping.